Scout Inflatable is proud to sponsor this article. Getting out on the water is one of the most popular pastimes at a destination. While enjoying favorite activities is one thing, getting a watercraft there with your RV may present a challenge. For instance, owners of travel trailers have usable space on the roof of a tow vehicle for rack-mounted kayaks, however, fewer options are available for those with motorhomes or fifth wheels. The Scout has a length of 12 feet with a width of 3.5 feet. When deflated, it measures 37 x 24 x 10 inches and fits in its designated tote bag, making it compatible for many RV storage compartments. Fishing a lake, bird watching in a state park, or taking a picnic basket on a day trip to a nearby island are a few pastimes that can be enjoyed. Kayaks are popular among the RV crowd for various reasons. Yet, while practical for some, the reality is that transporting them (especially for senior RVers) can be difficult. 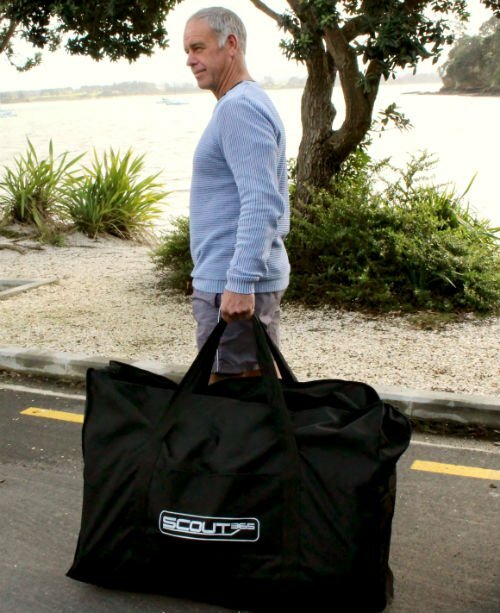 Based on the combined designs of dory fishing boats, kayaks and dinghies, the Scout has a length of 12 feet and a width of 3.5 feet when inflated. When deflated, it measures 37 x 24 x 10 inches and fits in its designated tote bag. It’s also light on the scale with a weight of just 68 pounds, making it compatible for many RV-dedicated storage compartments. The Scout can even fit in the trunk of a car. To reduce weight further (to just under 40 pounds), Kestrup suggests storing the two paddles, two aluminum seats, and pump separately. “The concept of the Scout is to create a very stable boat ideal for many activities, while being lightweight and portable for RVing,” says Kestrup. The Scout in portable mode. To use, simply unroll the Scout, inflate it (that takes 10 minutes or even less with a 12V pump) and you’re ready to go. Additionally, the Scout has a weight capacity of 500 pounds plus ample space to bring along guests, food/beverages, and fishing gear. While underway, the Scout tracks well with its long, narrow waterline. There are a series of strakes (heavy layers of rubber) on its bottom protect it from punctures. For extra security, there are three air chambers—one for each of the pontoons and one in the inflatable floor. Drop-stitch air flooring, which consists of thousands of interwoven stitches to hold the sections of fabric parallel. It also absorbs vibrations and is extremely rigid (once fully inflated). Double-sealed Halkey-Roberts valves for easy inflation and deflation. Kestrup explains that even in the event of an extreme circumstance, such as punctures to the pontoons, users will still be able to make it back to shore. 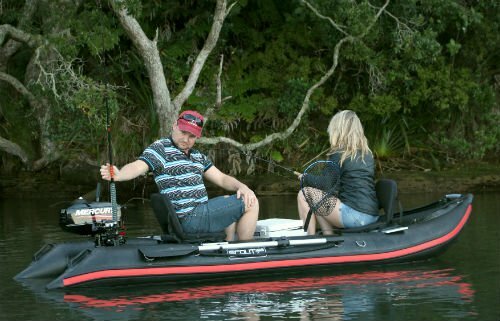 Users can row, paddle, or power the Scout by an optional gas outboard or electric motor. To enjoy activities, users can row, paddle, or power the Scout by an optional outboard or electric motor. What’s more is the seats are higher from the waterline. This allows more comfortable, upright seating positions while enjoying the convenience of the outboard power that’s available. The Scout has a maximum rating of 3.5 hp and many outboard options are available. While the engines are available separately, Kestrup suggests that the lighter the engine, the better. For instance, a lighter engine complements the overall light weight and portability of the Scout. As gas engines may be the ideal choice for some, electric motors introduced in recent years are also popular. They are now lower in cost and there are no restrictions for their use in State Parks. While the Scout measures only 12 by 3.5 feet, seating is versatile. There can be three rows of bench seating (the third bench is optional) and fit into UV-friendly straps on the pontoons. Comfortable seats with back support are also available. The long, streamlined profile of the Scout. According to Kestrup, another practical use for the Scout is it can accompany kayaks during a day trip. For instance, the kids can enjoy the kayaks while adults can ride along in the Scout with food, drinks, or other gear. If the kids get tired or the wind picks up, they can run a line to the stern of the Scout to assist them home. 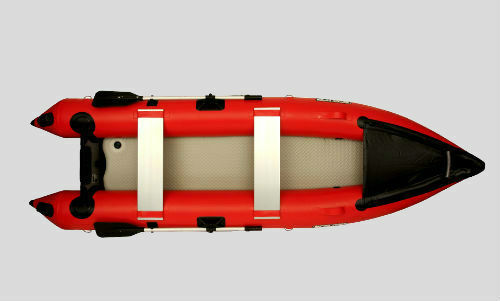 After use, the Scout can be inflated for several days and left at a dock or campsite. Kestrup suggests rinsing the boat after use, and should be kept out of direct sunlight when not in use. 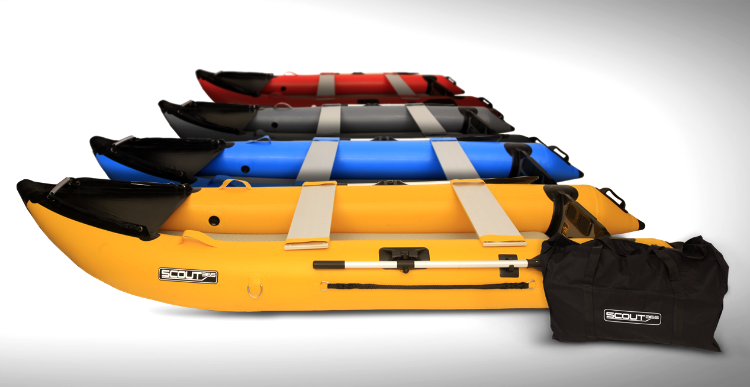 The Scout portable inflatable boat is available in yellow, red, and blue.